Here at Affinity Dental Clinic, we understand that our Richmond patients may suffer from dental anxiety and therefore can be extremely reluctant to contact us and book an appointment. Research has identified the Top 3 anxiety-causing reasons about dental visits – and here’s what we’re doing to make your every visit to Affinity Dental Clinic something to look forward to! Fear of pain is completely natural and the oral health care experts at Affinity Dental Clinic understand that anxiety associated with needles and the idea of pain/discomfort in the mouth can convince patients they’re better off suffering from oral health care issues than coming to the dentist. However, we want to set the record straight. Most dental procedures are currently pain-free. If you require sedation and dislike needles, we’ll offer you alternative options or conceal the needle if necessary. 90% of patients in one recent study reported that embarrassment is the no. 1 reason why they don’t visit the dentist. If you’re worried that you’ve neglected your teeth and your oral health care, come in for an appointment and learn about your oral health care options at Affinity Dental Clinic. We’re here to help and we promise we won’t lecture you! 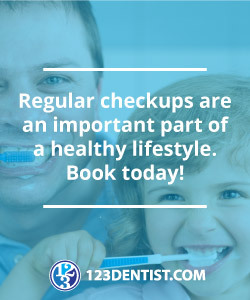 After all, we’re your oral health care partner and your oral health is just as important to us as it is to you. If you don’t like feeling like you have no control over what happens in the dentist chair, come to Affinity Dental Clinic in Richmond for a dental experience like no other. We promise to do our best to communicate with you, both online and offline. We’ll work out a system that allows you to alert us to any trouble or discomfort during a procedure. Contact us today and find out why we should be your Richmond choice for oral health care. Read our Blog for more secrets straight from your dentist. We’re social, too! Follow us on Facebook, Twitter and YouTube.